Here's a story about a dealer who did something unconventional, and it paid off, at least in the short term. In 1992, Cosby Swanson decided to fire the majority of his sales staff, reducing the team from 14 people to four. 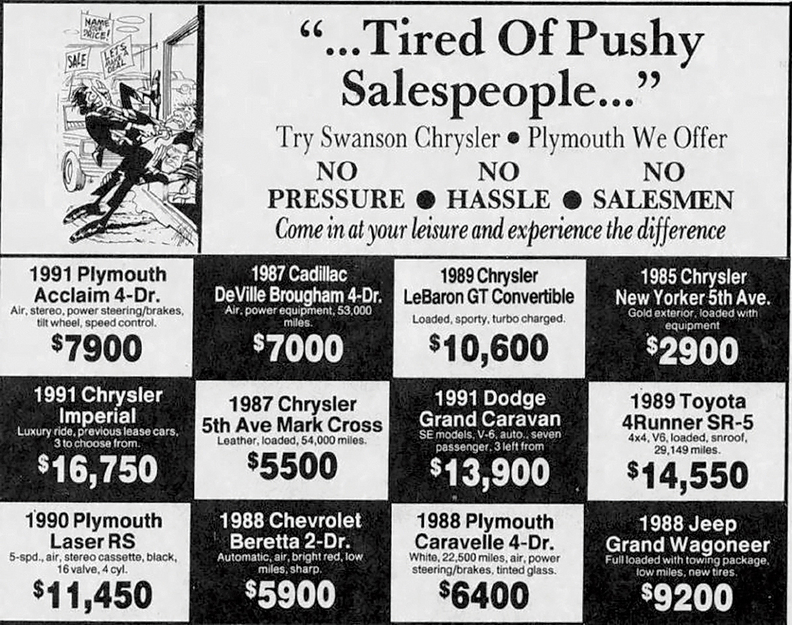 News from the St. Petersburg, Fla., Chrysler-Plymouth dealership made national headlines, with Swanson promising no-haggle prices and a low-pressure environment. The idea worked, giving the dealership the highest sales volume in its region. Given Swanson's success, which lasted until he sold the store in 1997, it's surprising more dealers haven't moved toward this model. But now, as more and more customers use the Internet to shop and lose patience with the car-buying process, the industry may be leaning toward adopting the no-haggle approach Swanson adopted back in 1992. More retailers are becoming more transparent in every deal they make, posting prices on web pages. This changes the buying process. The "deal" discussion — which consumers say they hate the most — happens online and often before they even enter a store. A recent study by Cox Automotive found that the percentage of buyers who visit two or more dealerships went down 7 percentage points in the last three years, to 59 percent in 2018. Simultaneously, buyer satisfaction with the price they paid for their vehicle went down 12 percentage points to 62 percent, and their trust that the dealership gave them the best deal fell 2 percentage points to 61 percent, according to the study. "The big shift in the car-buying process is when consumers submit a deal online or get to the point where they want to come into the dealership for a test drive," said Jessica Stafford, senior vice president at Autotrader. "Dealers need to be prepared to pick up in the buying process right where consumers left off." Jennifer Bartusiak, a spokeswoman for CarMax, the largest-volume used-vehicle seller, said the company's no-haggle approach will continue to be a critical differentiator. But even if they aren't haggling, Bartusiak said, salespeople will remain an important part of the process. Consumers will want to get help in dealerships, regardless if they do half of the process online, she said. "We believe that offering no-haggle and transparent pricing, financing and appraisals is ideal to allow the company's customers to buy a car from home in a simple and seamless way," Bartusiak said. "While many people want to conduct more of the process online, many still want to touch, feel, smell and test drive the car before purchasing it."